COLOR(S):Red and orange. May have white markings. 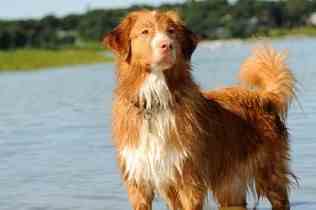 The Nova Scotia Duck-Tolling Retriever originates from Canada. Tolling Red Decoy Dogs probably accompanied their masters from Great Britain to Nova Scotia. They were crossed with retrievers and working spaniels. It was developed to toll (lure) ducks in the manner of the fox. The clever manner in which foxes work together to obtain a duck dinner has been observed over the centuries. The Nova Scotia Duck-Tolling Retriever looks somewhat like a small Golden Retriever. It is a well-muscled dog that is medium to heavy boned. Sensible and very devoted to its family. These dogs are intelligent, easy to obedience train and good with children. They make great companion dogs as long as they get enough exercise to fulfill their energetic needs. Tollers may be a bit more reserved around strangers than the Golden Retriever. The water-repellent, double coat of the Nova Scotia Duck-Tolling Retriever should be combed and brushed with a firm bristle brush, paying particular attention to the dense undercoat. Dry shampoo regularly, but bathe only when necessary for it removes the natural oils in the skin which make it naturally water resistant. This breed is an average shedder. This is a healthy working breed that is increasing in popularity. With its limited gene pool, a corresponding increase in some health dangers have occurred. Besides some thyroid and autoimmune problems, progressive retinal atrophy is starting to show up. These high energy dogs need a lot of physical exercise. They need to be taken on a brisk, long, daily walk or jog. While out on the walk the dog must be made to heel beside or behind the person holding the lead, as in a dog\'s mind the leader leads the way, and that leader needs to be the human. In addition, they will enjoy it if you throw a ball or stick for them to retrieve. Tolling (luring) is a natural trait (like pointing) and cannot be taught. They have an intense natural excitement about their duty. Young dogs need to practice; training sessions involve establishing a close relationship and having children throw things for them to retrieve. Some owners say the Toller is a retrieving fool. They love retrieving games! These are excellent family pets which get on well with other dogs and animals. They are very patient with children.